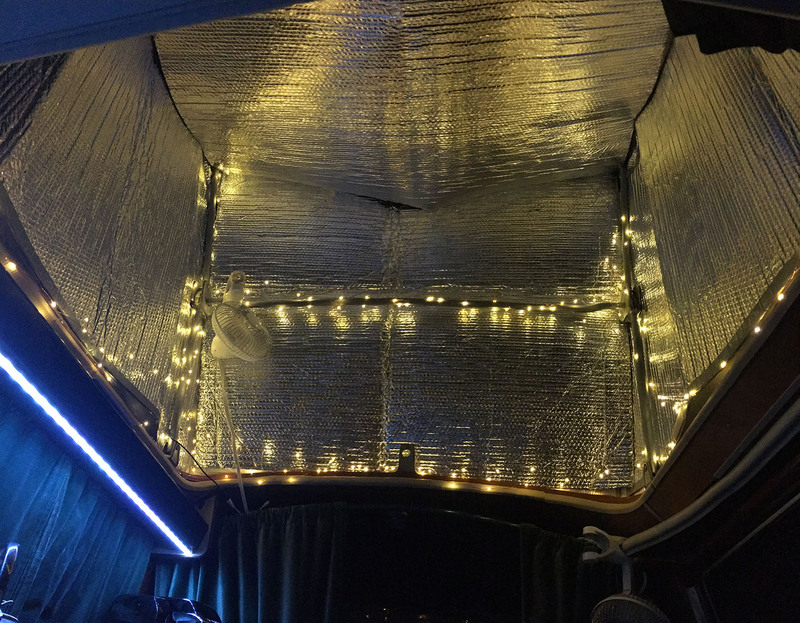 I’ve been experimenting (non scientifically) with insulation this winter in my 1983.5 Vanagon Westfalia. It gets quite cold here in Michigan this time of year, so I need to keep warm and be as energy efficient as possible. 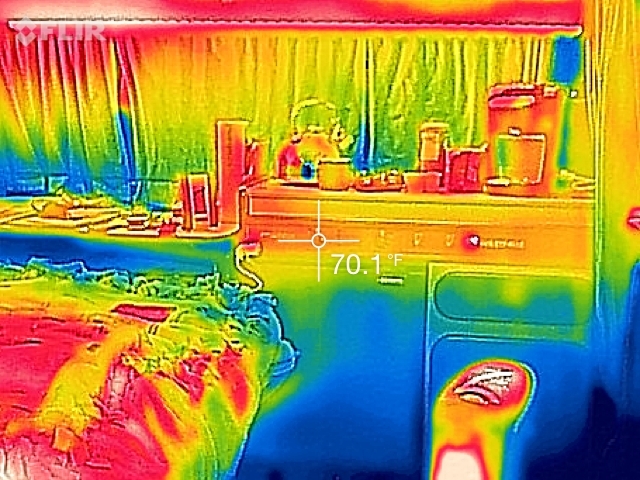 I heat the van using a Little Buddy propane heater, and an electric space heater. During the day I leave the heat off in the van, and when I return in the evening I turn both heaters on to bring the van up to temperature. Once the temperature is at a comfortable level, I switch over to just the electric space heater. The Little Buddy space heater really helps heat things up quickly, but I’m not crazy about the slight smell it gives off. 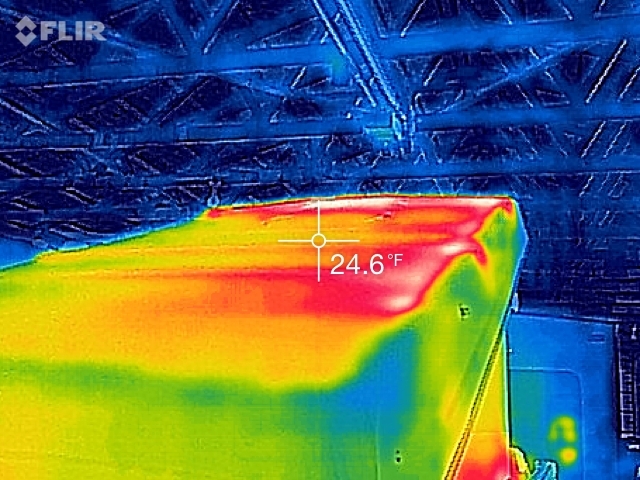 The following post illustrates just how much heat loss is occuring through the roof of our pop-tops, and one way to alleviate the heat loss using Reflectix. The following pictures were taken on the evening of December 22nd. The following picture of the roof was taken before I added the Relectix to the ceiling. 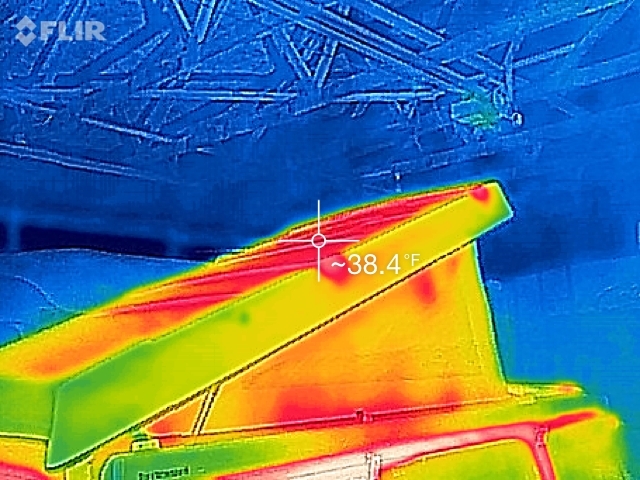 You can see that the temperature of the roof is 38.4 degrees Fahrenheit, and quite a bit warmer than the ambient temperature inside the barn. Between 10-11 degrees warmer. In other words, I’m loosing a ton of heat through the roof itself. Looking at the picture above reminds me of the lawyer character, Chuck McGill, in the TV show “Better Call Saul”. The one that is has the electromagnetic sensitivity condition (psychological) and tries to shield himself from it all. Oh no… LOL! The following pictures were taken the following morning, December 23rd. The Reflectix ceiling panel had been in place all night. 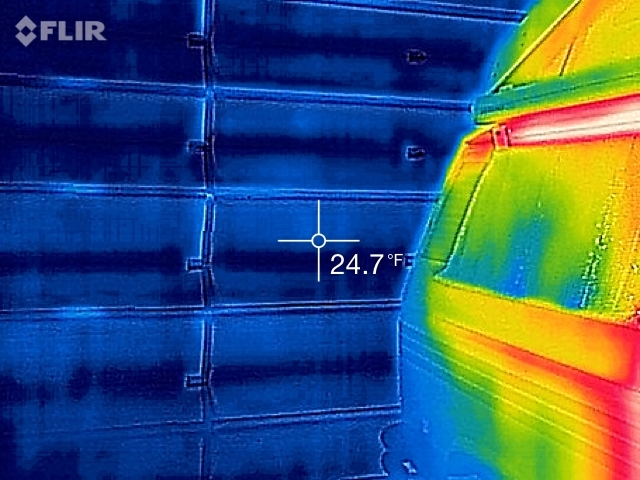 As you can see, the temperature of the van’s roof is much lower and closer to the ambient temperature in the barn. 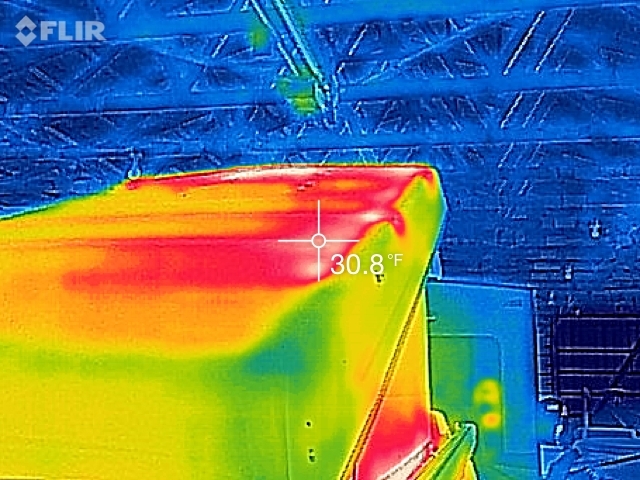 Less heat loss! Sweet! 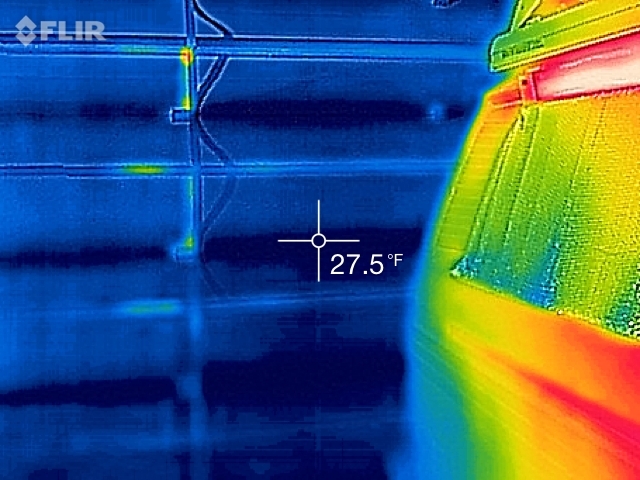 In the following picture, you can see how the temperature along the passenger side of the pop-top is quite red, and the temperature is warmer than my readings above. Like I mentioned earlier, the ceiling panel was loosely placed along the ceiling. It must have shifted overnight, leaving a gap for some warm air to escape. If you’ve read this far, thank you! I appreciate it! =) Hopefully this has helped you in some small way when it comes to your insulating questions. 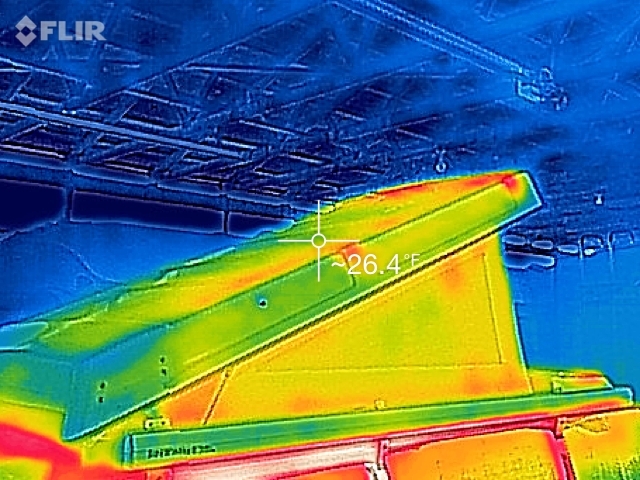 I feel the Reflectix ceiling panel is quite effective at keeping the heat in. It’s now less drafty, and the heater seems to kick on much less than it used to. Come back soon for several more installments on this topic. I’ll be doing a post showing the effectiveness of insulation on the tent walls, and also the windows themselves. POST EDIT (01/01/2017): Part 2 is now up! See it HERE! This entry was posted in VW Vanagon Westfalia on December 26, 2016 by Wolfy. 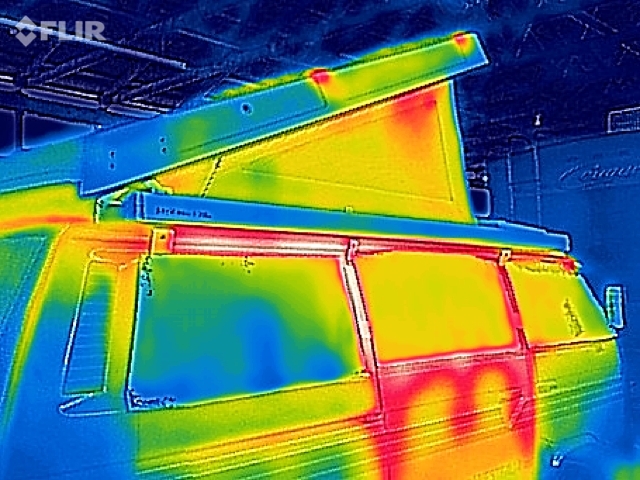 Heating with a heater budy will cause the moisture level in the Van to be to high. Burning a liquid fuel brings water . you may find condensation causing mildew or mold in the roof at the back corners . using electric can negate the issue. Thanks Douglas. Agreed 100%. The van is pretty leaky/drafty though, so it’s not as much of an issue in our Westies as other types of vehicles. I have two fans going for air circulation, and I also keep one of the front windows cracked. In addition, I have removed the flocking from the ceiling of my pop-top, which is the big moisture trap and petri-dish for mold. I really like the way the ceiling looks now too, without the flocking. I used a marine grade 1-part epoxy paint when I restored my pop-top. I used it on the exterior and interior of it. This looks experimentally based to me…. good job! 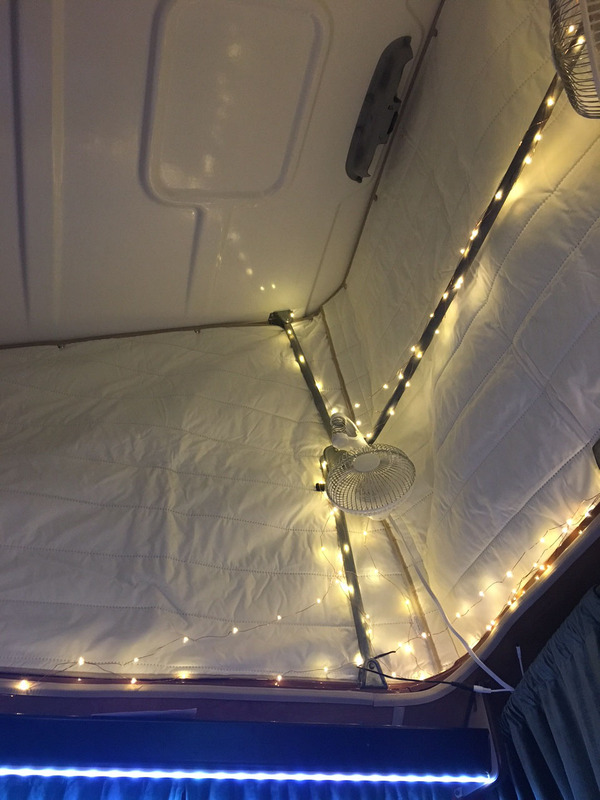 When it is less than 32 F (I know this is bathing suit weather for Canadians… but we are cold wimps from CA) we just keep the top popped down which not only reduces most of that tent and top heat loss, but decreases overall internal air volume. By also adding Reflectix on the windows we have gone down to 16 F in the Sierra and kept a comfortable enough 60 + F inside. Awesome, thanks for taking the time. 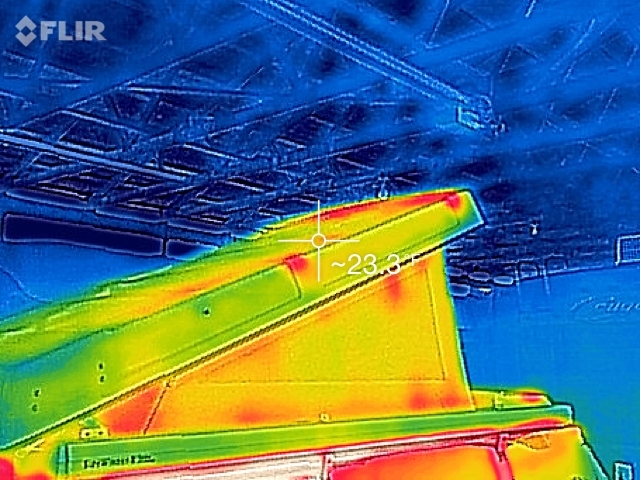 This is supper useful data for those of us without a flir camera. So far I’ve got Jonce’s (francher’s) beautiful poptop insulation which is awesome winter or summer and also keeps the noise down. When installed, it’s like sleeping in an anechoic chamber. Standing up with head in poptop, makes all sorts of sounds go away. 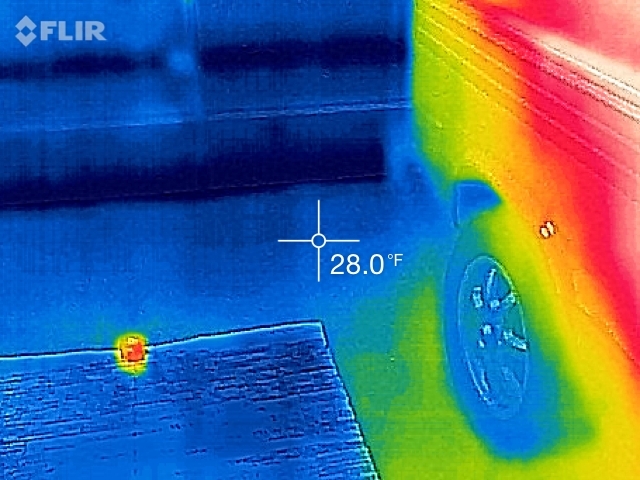 I also just received the back door thermal. Very excited to use it with a hatch tent for showering and bathroom. It will keep inside warmer and water and smells out. Thanks again for taking the time. Thanks for the kind words. I’m glad you’re finding the information useful. I’m looking forward to writing more articles. I have the same leds as you lol, are you me? Loookng forward to reading the rest of your blog.